I have not updated this site often at all, as my time is mostly spent on the social media sites and the newly created networking sites for academics. So for the most updated information please go there. You can find the links down below. Thanks. 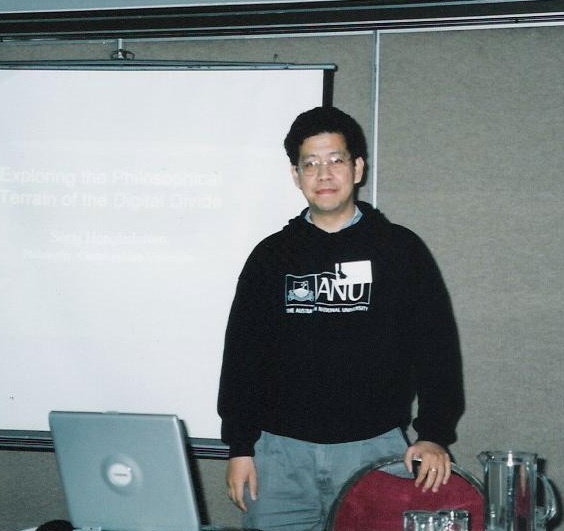 Soraj Hongladarom is professor of philosophy and Director of the Center for Ethics of Science and Technology at Chulalongkorn University in Bangkok, Thailand. He has published books and articles on such diverse issues as bioethics, computer ethics, and the roles that science and technology play in the culture of developing countries. His concern is mainly on how science and technology can be integrated into the life-world of the people in the so-called Third World countries, and what kind of ethical considerations can be obtained from such relation. A large part of this question concerns how information technology is integrated in the lifeworld of the Thai people, and especially how such integration is expressed in the use of information technology in education. He is the editor, together with Charles Ess, of Information Technology Ethics: Cultural Perspectives, published by IGI Global. His works have also appeared in Bioethics, The Information Society, AI & Society, Philosophy in the Contemporary World, and Social Epistemology, among others. "I am a researcher and a philosopher of technology. My research has been focused on how technology has an impact on non-western culture, a complex phenomenon that contains many dimensions. For one thing, I have investigated how non-western cultures adopt new technologies in such a way that they co-opt and include the technologies in such a way that the latter become part of their daily lives. This phenomenon is interesting because there have many cases where such integration does not occur effectively, and when cultures feel that the technologies are alien to them it will create friction, causing disruptions within that culture. For example, I have studied how the Internet is adopted by Thai culture. When it was first introduced, the Internet was seen as something remote, technically demanding, hence not useful for general use. But nowadays even villagers in the countryside are engaging intensively with their peer on the Internet on a large variety of issues. What I looked at is how this came about in such a way that the villagers or an average Thai retains their cultural identity even though they are deeply involved with the Net." Another area I have been involved with is concerned with a more directly philosophical question of how issues in information ethics are justified according to the philosophical system of the East. For example, I have undertaken a project on how privacy is to be justified in Buddhism. This is important because in order for concepts such as information privacy to be fully integrated into the lives of the cultures (issue related to in the above paragraph), a way needs to be found to base the concept on the philosophical system that belongs to that culture. This project is also relevant to others as it shows how an issue in information ethics could be couched also in other philosophical system, which is very deeply different from the usual Western one. A longer term significance of my projects concerns our more complete understanding of how ethical issues and cultures are related. Ethical guidelines are usually formed through deliberation only among those in the West, while participants from other cultures or from non-western countries apparently have to adopt the Western philosophical system in order to participate. I have tried to show that this is too parochial, since the world is much more extensive than only the West. Inclusion at the deeper level of philosophical system itself--not only around the issues themselves but also around the question how those issues should be justified or even whether they should be included as ethical at all--appears to be in order if we are to build a more inclusive world. My Résumé The most updated one is here! The information below this line is very old (Be warned! ), and is still here only for archival purposes. The Eighth Asian Bioethics Conference (ABC2007), March 19-23, 2007, Chulalongkorn University. You can download the entire book on Science in Thai Culture and Society right here. This is a PowerPoint file. To read it you need a copy of PowerPoint or PowerPoint viewer. Here is a piece I wrote as a comment on the drafting of the new charter for Chulalongkorn University. This piece (in Thai) recently appeared in Research Community, a newsletter published by the Thailand Research Fund. This paper was presented at the First International Conference on Cultural Attitudes Toward Communication and Technology (CATaC 98), Science Museum, London. This paper examines Stevens' poetry and with an eye toward the age old philosophical problem of realism. This paper was presented at the Second APPEND Conference at Chulalongkorn University, May 6-8, 1998. It will be published in an annual publication of APPEND, edited by Philip Cam and Mark Tamthai. This file has been awarded with the "StudyWeb© Academic Excellence Award" by StudyWeb.com. This paper looks at the problem arising when philosophical issues are introduced into the practical nature of teaching critical thinking. This paper was written back in 1991, as an offshoot from his Ph.D. dissertation on Kant's theory of imagination. This is the paper written for an Association of Southeast Asian Institutions of Higher Learning conference in July 1994. This paper was published in Asian Review 1993. This is a paper presented at the Sixth East West Philosophers' Conference at the University of Hawaii at Manoa in January 1995. This paper was read at a symposium on the humanities agenda for the next century organized by Sri Nakarinwirote University at Prasarnmit in July 1995. This paper was presented at the Sixth International Conference on Thai Studies in October, 1996. This paper was presented at the Online Conference on Buddhism and Human Rights in 1995 organized by the Journal of Buddhist Ethics. It eventually became part of the book, Buddhism and Human Rights, edited by Damien Keown and Wayne Prebish and published by Curzon Press.